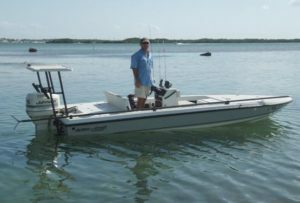 I run an 18 foot Action Craft skiff for my backcountry, bay, flats and Everglades National Park trips. This boat can pole quietly into 8 inches of water, but is still a very dry and solid fishing platform. 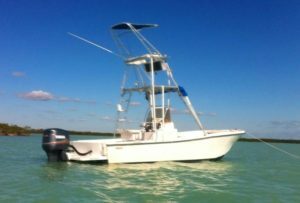 Action Craft is one of the most popular boats used by professional guides in all of South Florida. I love this boat and take pride in keeping it very well maintained and in top shape. It sports a 2015 Yamaha four-stroke engine for a quieter, faster and more efficient ride. I also run and 26 foot Mako center console with a 2014 Yamaha four-stroke engine for reef, edge and offshore fishing. This is a classic hull design and totally made for fishing. They don’t make boats like this anymore. She handles the seas well, there’s plenty of room and the view from the tower is amazing.